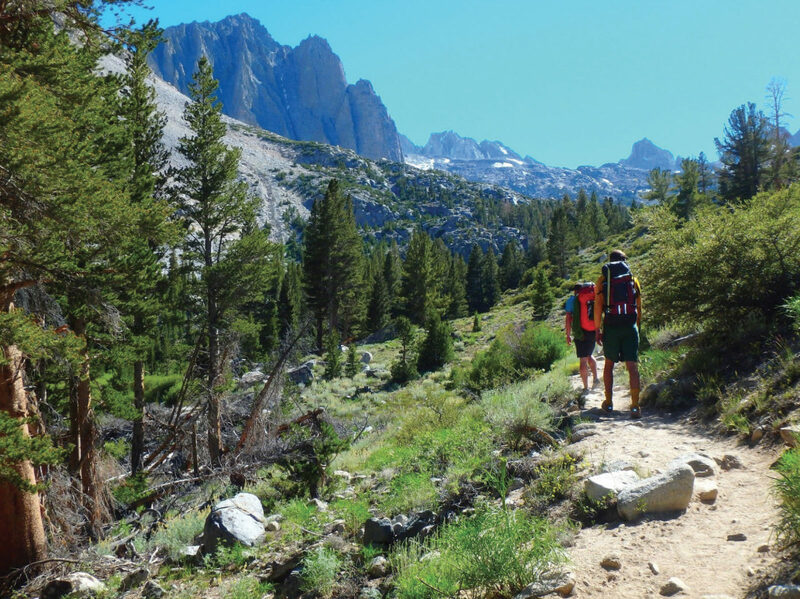 This article is based in part on the first author’s experience hiking 750 miles (1,207 km) of the Pacific Crest Trail from the Mexican border near Campo, California, to Chicken Spring Lake in the High Sierra in the late spring and early summer of 2016. During his 44 days on the trail, he encountered hundreds of day, section, and thru-hikers of all ages, genders, ethnicities, races, and nationalities. The impression they left on him inspired these observations. The Pacific Crest Trail (PCT) spans 2,660 miles (4,281 km) from its southern terminus on the Mexican border to its northern terminus on the Canadian border. It runs the length of California, Oregon, and Washington, and traverses desert, mountain, and forest environments with intermittent touching of civilization via a handful of small communities along the way. Travel on the PCT has increased dramatically in recent years for many reasons, including Cheryl Strayed’s best-selling Wild: From Lost to Found on the Pacific Crest Trail (2013) and the popularity of the movie by the same name. For example, the total number of thru-hiking permits issued by the Pacific Crest Trail Association grew from 1,879 in 2013 to 4,453 in 2015 (Pacific Crest Trail Association 2016). The PCT passes through several political jurisdictions, including 6 national parks, 4 national monuments, 7 Bureau of Land Management field offices, 25 national forest units, and 5 state park units. According to the Pacific Crest Trail Association (2016), “a remarkable 54% of the PCT on federal land is federal wilderness.” The trail passes through 48 federal wilderness areas and has “more tread in wilderness than any other trail” (Pacific Crest Trail Association 2016). Moreover, in addition to sections of the PCT that are located in federally designated wilderness areas, there is an expectation that much of the trail, with the exceptions of road crossings and resupply points, should maintain its wilderness character. Given the rapidly accelerating use of the PCT, how best to retain its wilderness character is an important question to ponder. Our purpose in writing this article is to discuss one aspect of the burgeoning popularity of the PCT, the prevalence of increasingly sophisticated technology carried by hikers in the form of smartphones and their applications. Our premise is that this growing electronic connectedness is changing the nature of hiking the PCT, and it is time to reflect on the desirability of this change in planning for the future of the PCT, as well as in planning for the future of other trails throughout the United States and around the world. To the extent that all trails offer unique opportunities for immersion in nature, we believe the increasing phenomenon of electronic connectedness is relevant to trails of all types. Our line of thought is anchored in Robert Moor’s (2016) On Trails: An Exploration, and his description of how trails can metamorphose from corridors connecting people to places into conduits for rapid communication in a way that transforms landscapes into techscapes. To the extent this phenomenon is happening along the PCT, we ask readers to consider the costs and benefits of such a transformation and whether anything can or should be done about it. Such diversity makes generalizations difficult, but it is fair to say that PCT hikers share two primary characteristics: they are mainly in their 20s and 30s (Hill, Gomez, Goldenberg, Freidt, Fellows, & Hill 2014), and they come from urban settings throughout the United States and abroad. In other words, they are young city dwellers who live their everyday lives somewhat distanced from nature. Demographically, they also represent the future. Indeed, one of the most encouraging aspects of increasing numbers of young people hiking the PCT is that they have an opportunity to connect with their fundamental ground of being. Getting back to nature, it would seem, is a really good thing for them to be doing. At the same time, these young urbanites are, in part, products of their social and cultural habitats, all of which have defined, constrained, and/or exacerbated tendencies toward a sense of technological dependency. We believe these connections to technology, which have spawned multiple benefits for individuals and society, may also interfere with their ability to connect with their biological moorings. According to a recent Pew Center study (Lenhart 2015), most children in the United States receive their first wireless device by the age of 12. Ninety-two percent (92%) of teens between the ages of 13 and 17 report being online every day, and 24 percent are online “almost constantly.” By the time they reach adulthood, today’s teenagers are a “wired” generation and their predilection for immediate connectivity permeates all aspects of their lives, including hiking the PCT. The vast majority of PCT hikers encountered by the first author in the spring and summer of 2016 carried smartphones equipped with Half Mile and Gut Hook apps. (Note: Half Mile and Gut Hook apps use Global Positioning Systems that do not require cell phone service. Essentially, for many PCT hikers, the apps replace the need for a map and compass.) Through countless observations and conversations, it became apparent that these apps made it possible for hikers to know exactly where they were on the trail (to the third decimal point), where the next reliable water source could be found, and where the next campsites were located. The apps also identified other points of interest along the way, including gates, roads, and prominent landscape features, as well as relaying information about trail closures due to fire (there were three such fire-related closures in southern California in the early spring/ summer of 2016), habitat protection (there was one such closure in the San Gabriel Mountains north of Los Angeles to protect the habitat of the mountain yellow-legged frog, an endangered species), and other obstacles awaiting them farther down the trail (there was yet another 10-mile (16 km) road detour in the San Gabriel Mountains to avoid an overgrowth of poodle-dog bush that causes severe allergic reactions similar to poison oak and poison ivy). The apps were also useful for redirecting hikers who wandered off the trail back onto the trail. Finally, wherever cell phone service was available along the PCT, hikers texted and emailed one another to keep abreast of any issues looming up ahead. Essentially, the precision of apps was replacing the imprecision of guidebooks that hikers relied on in the past. While it is easy to appreciate the value of smartphones for safety reasons and for the immediacy of answers to most any trail-related questions (e.g., identifying an unknown wildflower), there is something disconcerting about relying almost exclusively on sophisticated electronic technology to navigate the PCT. Such technology appears to be antithetical to what trail experiences were designed to be about (Cole 2001; Moore 2008). It seems that self-reliance is being replaced by technological reliance, which in turn is leading to psychological distancing from the hike itself. Why should this matter? In On Trails: An Exploration, Moor (2016) examines the history of trails for humans and animals alike. He reasons that while trails come into being as a way to connect living creatures with places they wish to go, to get them from point A to point B, trails can evolve other kinds of uses. “Since the rise of electrical engineering in the nineteenth century,” Moor contends, “a second sense of the word [trail] has gained widespread use. When two things remain distant, to connect them means to create a conduit through which matter or information can flow” (Moor 2016, p. 252). “A trace, when followed, becomes a trail,” Moor continues. “Likewise a trail, when transformed by technology, becomes a road, a highway, a flight path; a copper cable, a radio wave, a digital network. With each innovation we’re able to get where we want to go faster and more directly – yet each new gain comes with a feeling of loss” (Moor 2016, p. 254). While the first author was lost in the sights and sounds of the present moment, other hikers were less so. His fascination with trail conditions, hummingbirds darting here and there, and the occasional rattlesnake crossing his path was countered by their fascination with the latest music channeled from their smartphones to their earbuds. They also were preoccupied with what lay farther down the trail – water caches, trail magic (refreshments left by Good Samaritans), campsites, resupply stations, and other “oases” conducive to socializing – and they consulted their smartphones frequently for the latest updates on what was in store for them up ahead. Fostering warm relationships with others seemed especially important to the younger hikers (Goldenberg and Soule 2014; Goldenberg, Hill, and Freidt 2008), and they took every opportunity to linger at river crossings, hot springs, small towns, and trail angel rest stops (private homeowners welcoming thru-hikers to camp on their property) to savor “downtime” with like-minded others. For them, hiking the PCT was a social as much as a solitary experience. Indeed, they appeared to be experiencing the PCT as a network of “nodes and connectors” rather than as a continuum of landscapes. As Moor infers, “The importance of place and context – those two words whose meanings twine in the word environment – necessarily wanes as we transition to a world of nodes and connectors. The fact that trails enable just this kind of reduction in complexity has always been one of their chief appeals. But the faster we travel, the more intensely we feel our lack of relationship with the land we traverse” (Moor 2016, p. 255). The irony, of course, is that trails like the PCT were designed specifically to connect people to the land (National Park Service 2009). Meanwhile, technological innovations such as smartphones “pile up, one atop the other, each forming the foundation for the next, until an entirely new landscape, a techscape, emerges – like a city built on the ruins of past empires” (Moor 2016, p. 260). What, if anything, should we make of this? Is the lesson simply that life is characterized by change, and that we must adapt and adjust accordingly? Or is the lesson that wilderness’s meaning is socially constructed (Cronon 1995), and that a socially oriented and technologically grounded wilderness experience is as authentic today as any other kind of wilderness experience was in the past? Is there really an issue here, or is it the case that what the first author witnessed was merely a younger generation replacing an older generation? Is backpacking on the PCT simply a matter of style, or is there something else going on worth stewing over? And if so, what, if anything, should be done about it? Answers to these questions may well depend on where one is coming from philosophically. As Moor observes, “Wilderness [and wilderness trails] look different in the neon light of technology. In the traditional framework of wilderness preservation, a techscape is merely a despoiled wilderness landscape. But when viewed through the lens of technology, the wilderness can be seen as nothing more than an ultra- minimalist techscape designed to provide an escape from other, more baroque techscapes” (p. 261). From this perspective, the appropriateness of advancing electronic technology on the PCT is really not an issue. After all, improvements in other kinds of backpacking equipment reflect advancing technology as well. From boots to tents to sleeping bags and pads to cooking utensils to stoves to food preparation, they all can be seen as manifestations of continual technological refinement. Gear is constantly being made lighter and more efficient. Smartphones with solar-powered recharging panels have merely replaced maps and compasses as part of a backpacker’s standard equipment. Why should they be thought of any differently than other technological advances? An answer may rest in the fact that, unlike other backpacking equipment, smartphones do not bring hikers closer to nature. On the contrary, they make it easier for hikers to distance themselves from nature even as they are immersed in it. As Joseph Sax implored in Mountains Without Handrails (1980), anything that gets in the way of, or buffers us from, experiencing nature firsthand should be avoided; those aspects that complement nature without overshadowing it are to be supported, because they refine the focus on the surrounding landscape. From this perspective, smartphones are part of that “baroque techscape” from which trails are intended to be an escape. Indeed, smartphones on the PCT may well be contributing to the gradual metamorphosis of an “ultra-minimalist techscape” into the “baroque techscape” hikers believe they are walking away from. It would be easy to conclude that what is happening along the PCT simply reflects change; an old generation of hikers being replaced by a new generation of hikers, and an old generation of technology being replaced by a new generation of technology. Baby boomers are being replaced by millennials, and maps and compasses are being replaced by smartphones with solar-powered rechargers adorning backpackers’ backs. It is one thing to lament change. It is quite another to propose something be done to prevent it. Yet that proposal is what we leave the reader. In a world that is now often urbanized, and in cultures increasingly detached from the land that sustains them, anything that brings us closer to the land, anything that brings us closer to the ground of our being, is desirable. Conversely, anything that detracts us from our connection to the land is undesirable. We believe smartphones are a detraction. We recognize that smartphones are only one aspect of the information network and age of connectivity we now live in. However, smartphones symbolize the immediate access of that information and 24/7 connectivity of the digital age. Turkle (2015), in Reclaiming Conversation, reported that “average American adults check their phones every six and a half minutes.” This information overload and constant connectivity is changing how we interact with one another and how we interact with nature. Because much of the PCT passes through designated wilderness, the Wilderness Act (1964) is instructive. In Section 2(a) of the act, reference is made to “increasing population, accompanied by expanding settlement and growing mechanization” as a reason for a system of wilderness. Furthermore, Section 2(c) addresses wilderness as having “outstanding opportunities for solitude or a primitive and unconfined type of recreation.” Finally, Section 4(b) states that “each agency administering any area designated as wilderness shall be responsible for preserving the wilderness character of the area.” Our smartphone technologies are part of the “growing mechanization” referred to in 2(a); they compromise “opportunities for solitude or a primitive and unconfined type of recreation” referred to in 2(c); and they most certainly diminish the full presence necessary to appreciate the “wilderness character of the area” as mentioned in 4(b). We think smartphones are antithetical to a wilderness experience. They distance us from experiencing our relationship to, and dependence on, nature by diverting our senses from what is going on around us and fully appreciating the “solitude” and the “wilderness character” of the landscape we are walking through. Smartphones subtly transform our proximal nature into a distal nature. They allow us to think we know what we are doing when, in fact, they do the knowing for us, a sort of “growing mechanization” that many are now depending on. They tell us where we are, where our water will be, and where we should camp at day’s end. Smartphones make these decisions for us, and we happily allow them to do so without realizing we are sacrificing our agency and our responsibility for making our own way down the trail. The experience is no longer one of “primitive and unconfined recreation.” For these reasons, we believe smartphones should be discouraged along the Pacific Crest Trail and along other trails like it throughout the world. At the minimum, land managing agencies responsible for hiking experiences such as those found on the PCT should initiate a plan of outreach and education. In the PCT’s case, this will mean coordinating among many different federal and state agencies. It will require providing information on websites (such as that of the Pacific Crest Trail Association) that emphasizes the downside of depending on smartphones and how their use compromises a wilderness experience. Efforts should also be made to work with planners, bloggers, outdoor recreation information outlets, and others to frame the PCT experience as one reflecting values of solitude, primitive recreation, and self-reliance. In the end, hikers are independent thinkers and they will make their own decisions. But if the benefits of leaving technology behind are made clear, then hikers may be inclined to make better educated and more thoughtful decisions consistent with the intent of the Wilderness Act. The advantage of leaving technology behind is revealed in an undiminished encounter with nature and a kaleidoscope of wonders that can be experienced when we are finely tuned to the present moment and all that is going on around us. Toward the conclusion of The Hour of Land, Terry Tempest Williams (2016) reasons that it is “time to reimagine our public lands as sanctuaries, refuges, and sacred lands. Time to rethink what is acceptable and what is not” (p. 364). We wholeheartedly agree. DANIEL DUSTIN is a professor in the Parks, Recreation, and Tourism Program at the University of Utah; email: daniel. dustin@health.utah.edu. LARRY BECK is a professor in the L. Robert Payne School of Hospitality and Tourism Management at San Diego State University; email: lbeck@mail.sdsu.edu. JEFF ROSE is an assistant professor in the Parks, Recreation, and Tourism Program at the University of Utah; email: jeff.rose@utah.edu. Bryson, B. 1998. A Walk in the Woods. New York: Broadway Books. Cole, D. 2001. Day Users in Wilderness: How Different Are They? Research Paper RMRS-RP-31. Ogden, UT: USDA Forest Service, Rocky Mountain Research Station. Cronon, W. 1995. Uncommon Ground: Rethinking the Human Place in Nature. New York: W. Norton & Co.
Goldenberg, M., and K. Soule. 2014. Outcomes of hiking the Pacific Crest Trail. Journal of Outdoor Recreation, Education and Leadership 6(1): 44. Goldenberg, M., E. Hill, and B. Freidt. 2008. Why individuals hike the Appalachian Trail: A qualitative approach to benefits [Abstract]. Journal of Experiential Education 30(3): 277–281. Hill, E., M. Goldenberg, and B. Freidt. 2009. Benefits of hiking: A means-end approach on the Appalachian Trail. Journal of Unconventional Parks, Tourism & Recreation Research 2(1): 19-27. Hill, E., M. Goldenberg, E. Gómez, S. Fellows, B. Freidt, and L. Hill. 2010. Comparison of Appalachian Trail and Pacific Crest Trail hikers: Motivations and benefits. Abstracts from the Coalition for Education in the Outdoors Tenth Biennial Research Symposium 10, 52–54. Cortland, NY: Coalition for Education in the Outdoors. Hill, E., E. Gomez, M. Goldenberg, B. Freidt, S. Fellows, and L. Hill. 2014. Appalachian and Pacific Crest Trail hikers: A comparison of benefits and motivations. Journal of Unconventional Parks, Tourism & Recreation Research 5(1): 9–16. Kyle, G., A. Graefe, R. Manning, and J. Bacon. 2003. An examination of the relationship between leisure activity involvement and place attachment among hikers along the Appalachian Trail. Journal of Leisure Research 35(3): 249–273. Moore, R. 2008. A wilderness pathfinder: Benton MacKaye and the Appalachian Trail. In Service Living: Building Community through Public Parks and Recreation, ed. Wellman, D. Dustin, K. Henderson, and Moore (pp. 55–71). State College, PA: Venture Publishing, Inc.
Muesser, R. 1998. Long-Distance Hiking: Lessons from the Appalachian Trail. Camden, MN: Ragged Mountain Press. National Park Service. 2009. The National Trails System Act (P.L. 90-543). Retrieved from http://www.nps.gov/nts/legislation.html. Pacific Crest Trail Association. 2016. Retrieved from http://www.pcta.org/our-work/ trail-and-land-management/pct-visitor- use-statistics/. Sax, J. 1980. Mountains Without Handrails. Ann Arbor: University of Michigan Press. Strayed, C. 2013. Wild: From Lost to Found on the Pacific Crest Trail. New York: Alfred A. Knopf. US Public Law 88-577. The Wilderness Act of September 3, 1964. 78 Stat. 890. Williams, T. 2016. The Hour of Land. New York: Sarah Crichton Books.